Natural disasters are no joke. They occur all the time and can be dangerous. From tornadoes to hurricanes to floods, every storm poses a threat to you and your vehicle. While auto insurance plans cover damages made after a disaster hits, proper preparation can enable you to evade having to deal with insurance companies. If you hear about a serious natural disaster heading your way, do yourself and your vehicle a favor and prepare for the worst. While some storms are unpredictable and may or may not affect you much, it is important to have and enact a disaster plan that ensures your safety and the safety of your vehicle whenever a natural disaster hits. 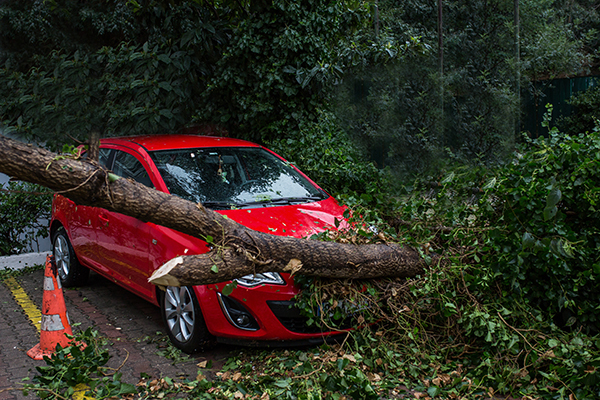 To help keep your vehicle away from disaster, the experts at CarRegistrationAdvisors.org explain how you can protect your vehicle before a natural disaster strikes. Park in a safe place – Whether facing a snowstorm, strong winds, floodwaters or all of the above, where you park your vehicle makes a difference. To decrease the chances of sustaining water damage, you should keep your vehicle elevated. The team at CarRegistrationAdvisors.org recommends either parking on high ground or propping your vehicle up with cinderblocks or bricks. The added height will help protect against rising water levels and lower the risk of interior damage. Additionally, the team at CarRegistrationAdvisors.org suggests finding a covered area to park your vehicle in. Garages or covered parking areas can shield your vehicle from falling debris and make your vehicle less susceptible to strong winds and precipitation. Please be sure to park your vehicle prior to the inclement weather to lessen its exposure to the storm. Avoid operating the vehicle – This is the most important thing you can do to protect you and your vehicle from harm. To ensure the safety of both you and your vehicle, it is best to abstain from driving in bad weather conditions. Road accidents are more likely to occur during severe storms, so driving is not advised. The team at CarRegistrationAdvisors.org recommends that you drive with extreme caution, if driving is absolutely necessary in these situations. However, during natural disasters, it is best to avoid driving altogether. Follow safety protocols – During poor weather conditions, local police may enforce mandatory evacuations and other precautionary measures to limit the effects the weather may have on certain areas. The team at CarRegistrationAdvisors.org reminds you that these protocols are meant to protect and support you, so they should be taken seriously. Not only do these safety procedures aim to protect you, but they are also meant to protect your vehicle. Roads may not be suitable for all vehicles during severe weather, and road condition warnings may be issued. Following protocols can reduce road accidents and help you find the safest places to store your vehicle.